If you consume alcohol on a regular basis, here is some information you’ll want to know. Past research has shown a link between alcohol intake and colorectal cancer. According to a recent study in the journal Gut, however, that risk diminishes when the alcohol consumed is wine, as opposed to beer and other spirits. Researchers in Denmark conducted a study of approximately 30,000 men and women between the ages of 23 and 95 over a period of nearly 15 years. The amount and types of alcohol consumed were determined at the beginning of the study period, and cases of colon and rectal cancer recorded in the Danish Cancer Registry were used to determine possible relationships to drinking alcohol. Those who consumed over 14 drinks per week in the form of beer and spirits only were over three times more likely to develop rectal cancer than non-drinkers. On the other hand, people who drank the same amount of alcohol, but reporting one-third of their drinks to be wine, were less than twice as likely to develop this form of cancer. The researchers also found that people who drank excessively (more than 41 alcoholic beverages per week) had twice the risk of developing rectal cancer than non-drinkers, regardless of the type of alcohol drank. This study offers two important points to alcohol drinkers: First, drinking any alcohol appears to increase a person’s risk for rectal cancer. 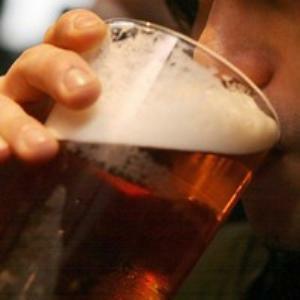 The more you drink, the higher your risk for cancer. Second, if you do drink, you may want to consider sticking to wine. The powerful antioxidants in wine appear to blunt some of the harmful effects of alcohol. Reference: Pedersen A, Johansen C, Grønbaek M. Relations between amount and type of alcohol and colon and rectal cancer in a Danish population based cohort study. Gut 2003:52(6), pp. 861-867.